Join us for an informal conversation with authors about their interests, literary and beyond. The Larkin Square Author and Speaker Series is a collaboration between Larkin Square and Talking Leaves Books. The Series features local and national authors of both fiction and non-fiction works. The Series also welcomes speakers on a variety of topics who may not have authored a book, but have an interesting story to share! Beer, wine and snacks are available for purchase from The Filling Station throughout the event. These informal talks are free and open to the public, and include time for Q&A and book-signings. Unless noted, talks begin at 5:30 pm with doors opening at 4:45 pm for sale of refreshments and books. Check back for updates to the schedule and new events, or sign up for our newsletter. 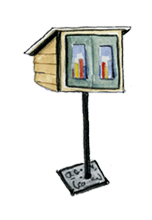 The Little Larkin Libraries were locally built by The Foundry in Buffalo. They are housed on the Boardwalk in Larkin Square and contain magazines and books available for browsing and borrowing. Feel free to add to the collection for all in Larkinville to enjoy! Books are available for purchase at all Author Series events, as well as at Talking Leaves Books.